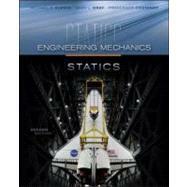 Plesha, Gray, & Costanzo's Engineering Mechanics, Statics & Dynamics,second editionis the Problem Solver's Approach for Tomorrow's Engineers. Based upon a great deal of classroom teaching experience, Plesha, Gray, & Costanzo provide a visually appealing, "step-by-step" learning framework. The presentation is modern, up-to-date and student centered, and the introduction of topics and techniques is relevant, with examples and exercises drawn from the world around us and emerging technologies. Every example problem is broken down in a consistent "step-by-step" manner that emphasizes a "Problem Solver's Approach" which builds from chapter to chapter and moves from easily solved problems to progressively more difficult ones. Engineering Mechanics is also accompanied by McGraw-Hill Connectwhich allows the professor to assign homework, quizzes, and tests easily and automatically grades and records the scores of the students' work. Most problems in Connect are randomized to prevent sharing of answers and most also have a "multi-step solution" which helps move the students' learning along if they experience difficulty. Engineering Mechanics, Statics & Dynamics, second edition,by Plesha, Gray, & Costanzo, a new dawn for the teaching and learning of statics and dynamics.